One of the simplest ways to really delight your attendees and keep them coming back for more is to give them more seat time at your events. Now you might be saying to yourself, "that's just not possible, our schedule is jam-packed?" But what if it was possible? What would happen if you shaved 10 minutes off your lunch break? Mayhem? Okay, how about 5 minutes off your lunch break and instead of 15 minute breaks between sessions, how about 10? It doesn't sound like a lot, but you never know what you might have at the end of the day. You might just end up with enough time for another session. Now you're thinking, "okay maybe it's possible, but how am I going to figure that out?" That's where we come in. We created a FREE easy-to-use tool that will let you create your event schedule in minutes. 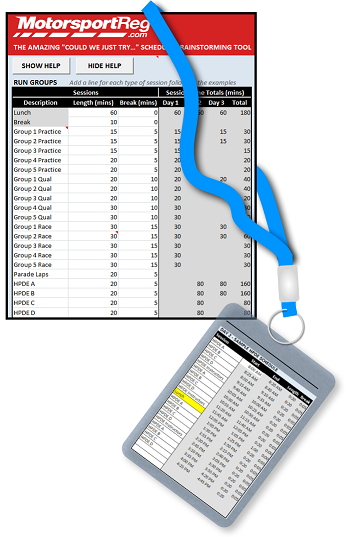 Add a few key inputs and our Excel-based template automatically generates your schedule. Because it's so simple to use and does the hard work for you, you can create multiple schedules and actually see what happens if you shave 5 minutes off your lunch break and move down to 10 minute breaks between sessions. So get cracking on that new schedule and find that extra session! You can thank us later.